We will discuss 10 most useful apps for Android. It is seen that when we purchase a new Android smartphone, then we need some useful Android app. But, we think that 20-30 apps are mandatory and most useful for our Android phone. 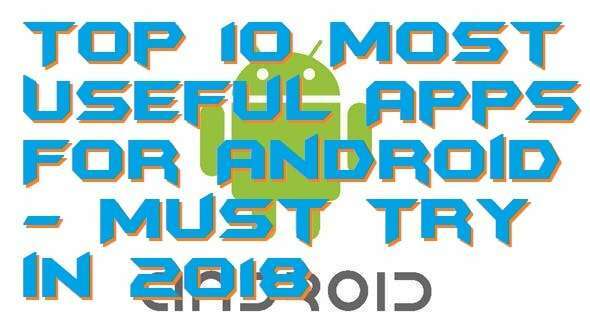 Well, you only need top 10 Android apps which is compulsory for your daily life. I have picked top 10 Android apps to clear the confusion about installing the too much Android app on your new Android smartphone. These are the top 10 most useful apps for Android smartphone which you must check out. So, let’s start watching the list of top 10 most useful apps for Android phone below. I had made the list of 10 most useful apps for Android phone which is very simple and easy to use. Also, they are free of cost, and some of them are paid. But, you can download and use it using its free version. Some of the apps are well known and very popular. But, some of them are not much used by an Android user where they are very much useful. So, I had mad the miscellaneous list of every most useful app for Android phone. Keep reading this article and check out the most useful apps for Android smartphone. MX player is one of the best and most useful Android apps. It comes for every Android user for free of cost. However, if you want to use its paid version then, of course, you can switch to the paid version too. The default video player of the Android phone only plays the mp4 and 3gp video file. Where the MX Player supports all types of video format such as WebM, MKV, etc. Moreover, it also works as the audio music player. So that you can also listen to audio music using it. It also gives additional features to its users like change theme, audio decoder, resolution changer, etc. It’s quality made it be on the list of top 10 most useful apps for Android. PicsArt is the most popular and first choice for the Android user to edit any image. The default image editor of the Android phone is very cheap and very poor. But, thanks to PicsArt that it is here for us to edit and create a beautiful image for any purpose. PicsArt is free to use and very simple to make any standard image into a beautiful image. In PicsArt, there are very professional types of features available. It has toning feature, changing curve, square fit, layer editing feature, and much more. The amazing feature of PicsArt placed it on the list of top 10 most useful apps for Android. Facebook Messenger is the well known Android app. Everyone knows that Facebook messenger is the app developed by the Facebook company which is the social media website. Almost everyone uses Facebook to chat, video call and voice call with their friends or relatives. It is not possible to do it with the Facebook website and Facebook official app as well. So, we have to install Facebook messenger because it is effortless and very straightforward to use. Click on the video icon and do a video call with your friends easily from your Android phone. It is straightforward, uses less data, and straightforward that is why it is on the list of most useful apps for Android. WPS Office is the another Android app which is very much useful. Its a kind of note making an app but with the advanced features such as word document making, PDF making, Spreadsheet making, and much more. In the default app for note taking and document reading, you can not do these task. However, WPS Office is free to use, but anyone can switch it to the paid version too. It helps for quick note taking, PDF creating, and much more. So, if these kinds of tasks matters in your daily life then you must use this app. Because of the advanced features, this app is on the list of most useful apps for Android. Truecaller is the best and most useful Android app. It helps to identify the true caller’s name or identity. In the default service of Android app, when we dial any number, then it shows wrong place. Also, when someone calls us then, it shows the wrong area from where the call is coming. In Truecaller, its also offers the more advanced feature which the default calling service doesn’t have such as blocking calls from the series wise number, operator service calls blocking, and much more. These fantastic features make this app to be in the top 10 list of most useful apps for Android. UC Browser is the one of the best and coolest browser. It is the best browser as compared to the default browser and Google Chrome browser which are already installed on any Androismartphonene. UC Browser has some cool features like popup blocking, high-quality image loading in less data, facebook mode, night mode and much more. However, some of the features can be present in Google Chrome browser which comes with a pre-installed app package on an Android phone. But, the advanced features which UC Browser is having will not be available in Google Chrome browser. This made UC Browser to be listed on the most useful apps for Android list. ShareIt is the fantastic Android app to send and receive media files such as photos or videos from one to another Android phone. In our Android phone, there is no feature to send and receive files from one to another Android smartphone. We can only use Bluetooth to do so. However, we all that Bluetooth takes much time when we send large files. Though, ShareIt does it within a second because it uses the WiFi facility on the sender and receiver’s Android phone. This made the ShareIt app to be present on every Android phone and is most useful apps for Android. Opera is the app that will allow you to use any restricted website or a web page. It is totally free of cost to used by any Android user. Basically, it gives the user a private virtual network to hide them and help to use any wishing website freely. There is no such feature and apps on an Android smartphone who can do so. However, it is also very much useful in boosting the internet speed and opening any website by hiding your IP address. So, from that point of view Opera is the most useful apps for Android. Oxford Dictionary is the most famous dictionary ap in the world. In the entire world, everyone knows about the Oxford University. This app is been developed by the Oxford University. Though, you can find any word’s related meaning in it. As well as you can use it to translate any word to another. Using this dictionary app is very simple and straightforward. Just simply install and you are ready to rock. There is no need to describe anything about this Oxford Dictionary app. A dictionary app is very important for us and it can be used anytime. So, that is why it is listed on the most useful apps for Android list. We all love to take selfies and to be captured by the cameras. But, we all know that the default cameras are very cheap and didn’t matter which Android app you are using. To give your selfies instant beauty there is a most famous app which is called Beauty Plus. This is an amazing and simple app. You can use it in offline mode too. Also, it has many filters already so that you don’t have to connect it to the internet connection. Just capture your pictures through this Android app and check the differences. However, no one knows when we have to take pictures of us or anyone else. That is why we must need to install and use this app every day. So, yes you can say that this is the most useful apps for Android. We have seen some most useful apps for Android. These all Android app are very much essential because they will give you ease to complete your job. Also, these Android apps are free of cost to use. However, they have their paid version too. But, the free version is also perfect to use. You don’t have to switch to the paid version. Now, you know that which Android apps you must use in your daily life if you use an Android smartphone. So, use these apps now and get a whole new experience on your Android phone. Share this article with your friends also so that they will know that what are some most useful apps for Android.